Groundbreaking, both ceremonial and actual, on the JSNN project happened in the last couple of weeks. One of the first actual tasks was to pull out some trees at the edge of the woods between our park and the NC A&T farm in order to make an access road and expand the parking lot. The trees were taken to the construction site where the largest chipper I’ve ever seen was sucking them up and spewing out mulch. 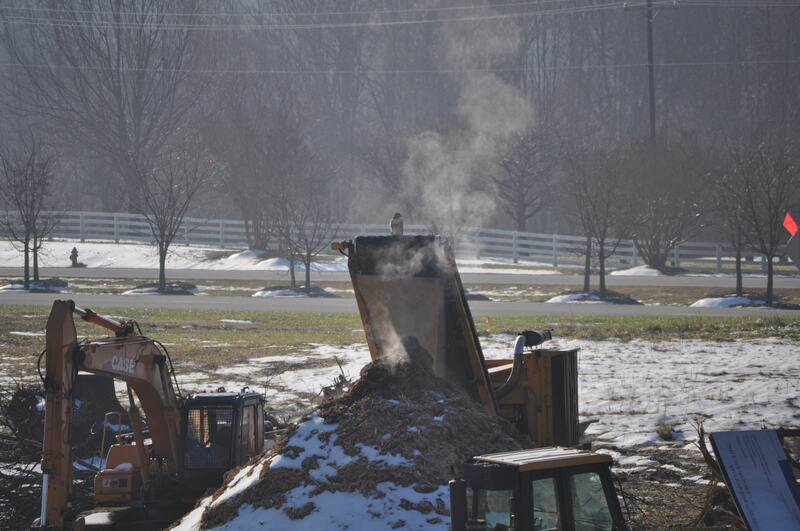 The mulch will be stored for a year or so then used on the grounds after the building is completed. Composting material generates quite a bit of heat and a two story pile of it must be quite warm. Given the cold temperatures of late, that warmth may be attractive. This lovely, who I have dubbed our Quality Control Director enjoyed a long steam bath this morning.